If you want to stay informed of St. Louis event and local information, subscribe to the Arch City Homes weekly email so you don’t miss any posts! I love working in coffee shops and cafes. Yes, I do have an office. And I work from home a lot. But, sometimes I find the office too distracting and home just too quiet. On these days, I go in search of a coffee shop with free WiFi so I can get some work done in an environment with energy and activity, but one where no one knows me and will stop by my table to chat. I have a few favorites that I tend to hit over and over, but I’m always on the lookout for new places to try. I have a list of requirements for my WiFi spots before I’ll grab my laptop and head out for a work session. My favorite places have all 5 of the features below. 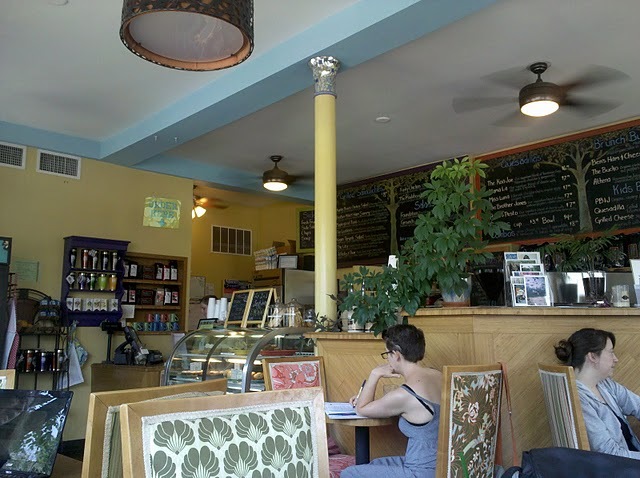 Where are your favorite places to grab a bite to eat or cup of coffee and get some work done? Where I go depends on what part of town I’m in. I’ve got a few favorites close to home, but it’s always nice to have some options for meetings across town or a place to fill the gap between 2 appointments. I recently discovered 2Schae Cafe since it is just a block from my new office. The place is owned by a really nice couple who is there every day, so they take care to make sure you are really happy. I like the menu and always have a hard time deciding what to order. My favorite things is their egg salad on toast…yum. 2Schae’s kitchen is in the middle of the cafe so you can see everything that is going on behind the scenes. The kitchen area splits the seating into a cafe with tables near the entrance and a couch area plus bar height seating at the window. That’s where I’ve sat most recently and really liked being tucked back in a corner to get my work done. 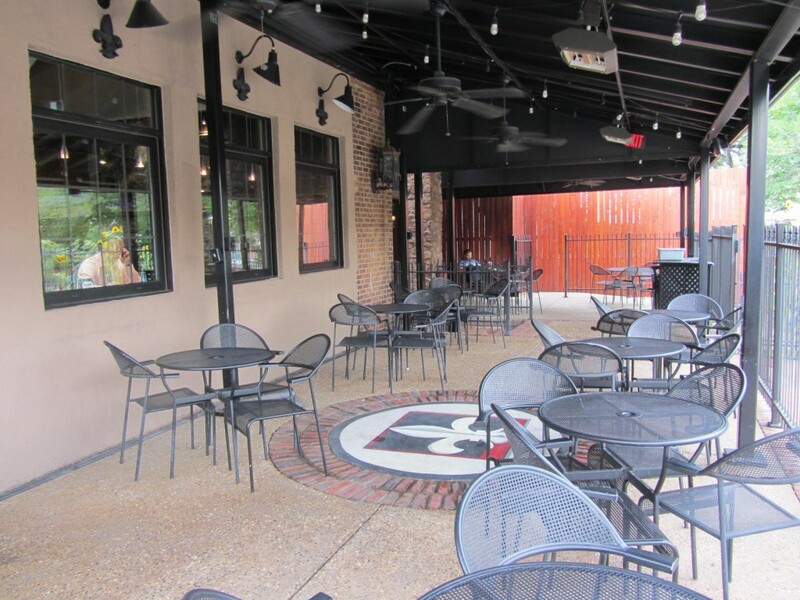 They also have a large outdoor patio for nice weather. The only drawback is parking is impossible. If it was better, I would be there all the time. Cafe Ventana is currently my favorite coffee shop. It is just a block from where I live and has everything I want. The food is great, even though the menu is limited. Give the salmon sandwich a try! They even offer 3 free beignets if you check in on Yelp. I always get the bottomless coffee and they are happy to get me refills as often as I’d like. The seating couldn’t be better. There are a couple of tables outside in front, some between the building and the property next door and a covered patio out back. Inside You can sit in the cozy main dining area with tables, counter seating and a few leather easy chairs, or you can go next door to the Annex which is where a lot of the SLU students hang out. I’ve never had trouble plugging in my computer, the noise level is perfect…enough buzz to keep you working but not enough to disturb you, and the fireplace makes the whole place cozy. Plus they have a parking lot. My only challenge is that the firewalls on their WiFi block a few websites that I need to use…including the real estate MLS system. So there are times when I just have to leave to finish my work. Located on the edge of the Washington University campus and only a few feet from University City and Forest Park, Kayaks is usually packed with college students and a few professors. Though I enjoy it anytime, I especially like going to Kayak’s when Washington University is on break and the students clear out, so I can have some choices in where I will sit. Still, I find the atmosphere energizing and love the extensive menu. Parking can be a pain. They do have a lot out back, but it is metered and I don’t always have change or remember to add some time to the meter when it runs out. So far I’ve been lucky and haven’t ever gotten a ticket. There are a few spots out front without meters, but it’s rare to find one open. The Metro train stop is directly outside of their door so if you prefer light rail transportation, this is probably the best option in town. Under construction is a covered patio space right outside…I can imagine that will make this place even more popular. 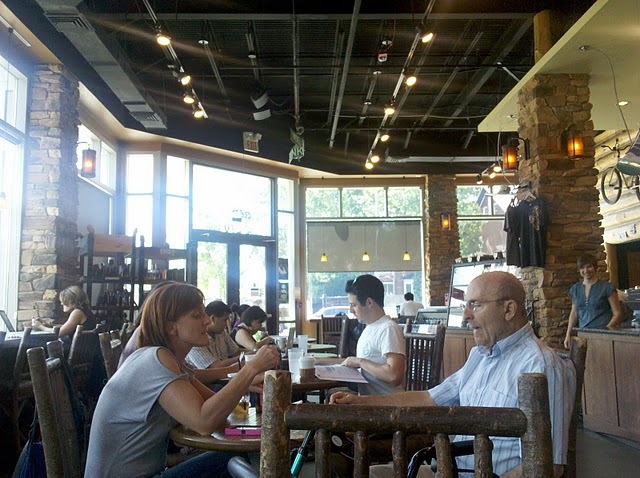 Another of my favorite coffee shops, Meshuggah has a post college hand-me-down furniture feel to it. There is pretty much seating with a small upstairs area which includes a couple of couches. The menu is somewhat limited, but the food is good and freshly made. My favorite is their pesto and fresh mozzarella covered bagel. They also serve beer and wine and are open late. My only gripe is that the espresso style coffee is too strong for me and doesn’t include free refills. Extension cords snake the floor and every table is typically filled late into the night with students, professors and an assortment of other laptop bearing customers. 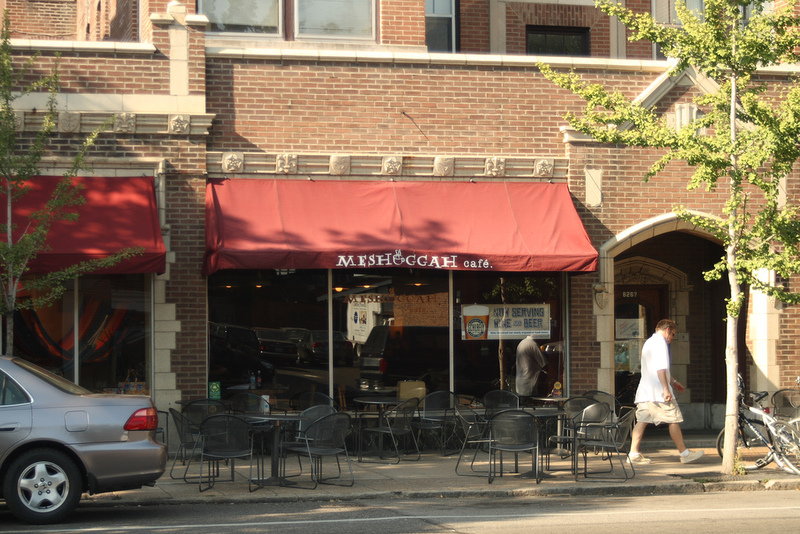 Located in the Loop, you’ll have to look for a parking spot on the street. I find I can usually get a spot that is pretty convenient, but it really depends on the time of day you stop by. Kaldi’s has 4 locations, and I like all of them. The menus are limited in Clayton, as are tables, outlets and parking, but Kirkwood and Chesterfield locations give me everything I want. 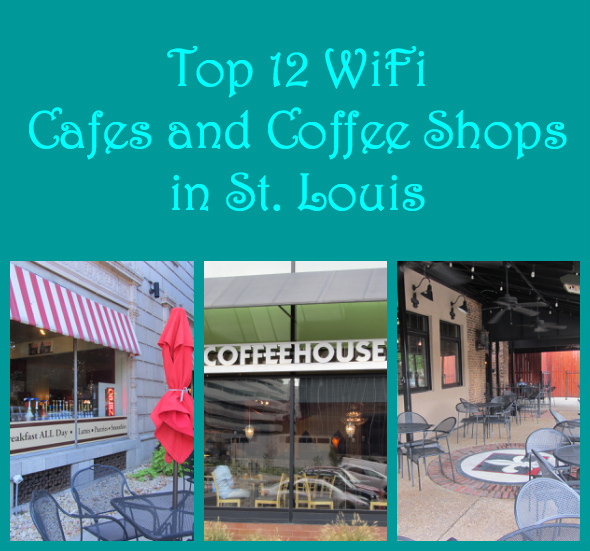 Kirkwood has the best mix for me – independent coffeehouse atmosphere, a bar stool height area with outlets set up for every seat and a full menu with tasty items. I also really love that when you get a sandwich, you have the option of getting a banana instead of chips. The only downside for the Kirkwood location is parking, but I can always find a spot within a block and there is a free parking garage behind the building (Chesterfield is the only location with easy parking). WiFi is free with a purchase but you have to ask for a WiFi code when you pay at the register. The Richmond Heights location at The Boulevard (across Brentwood from the Galleria) has everything I’m looking for in a coffee shop/cafe. The staff is friendly, the food is great, and I never have trouble finding an outlet…unless I show up right at lunchtime. They also serve wine and beer and fancy pastries if that’s your thing. But I usually stick with the bottomless cup of coffee and a crepe or panini. While the layout at this strip means you have to park in the garage rather than right out the front door, it’s never much of a walk to your car. Another independent coffee house, I would spend a lot of time at Foundation Grounds if it was closer to home because it has such a cozy neighborhood atmosphere. The menu is limited but the food is amazing, though a little on the pricey side in my opinion. This is a small place, but each time I’ve been there I was able to snag a table. Similarly, I’ve never had to walk more than a few doors down even though it’s 100% street parking on Manchester in the busy DT strip. My only negatives for this place is that they covered over their outlets because their electric system just couldn’t handle all of the computers plugged in, so you basically can only stay as long as your battery lasts. Plus, you only get 1 hour of free WiFi with purchase…after that you’ll need to go buy a cookie or something if you want another hour. 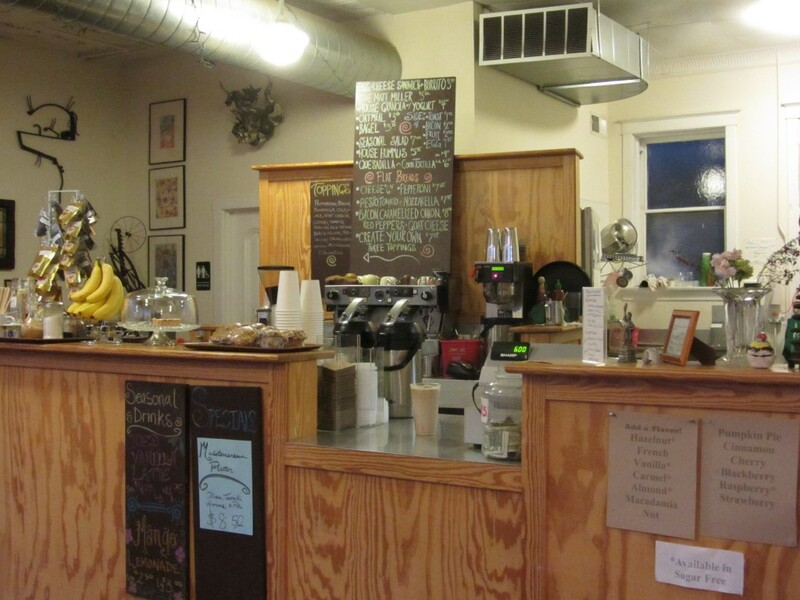 Off the beaten path, this coffee house feels like you are visiting at an unpretentious friend’s house. They even have a wall of books that I think are there for you to take…or maybe just read while you are there. I’m not sure. I’ve been to Stone Spiral a few times now, and I prefer it over Foundation Grounds for a place to work. The tables are well spread out and you never have trouble finding an open table or an outlet. While it’s all street parking, Stone Spiral is on a residential corner with no other businesses, so parking is a piece of cake. Their menu is pretty limited, but I’ve liked what I’ve ordered. The coffee is great, and the staff is really nice. 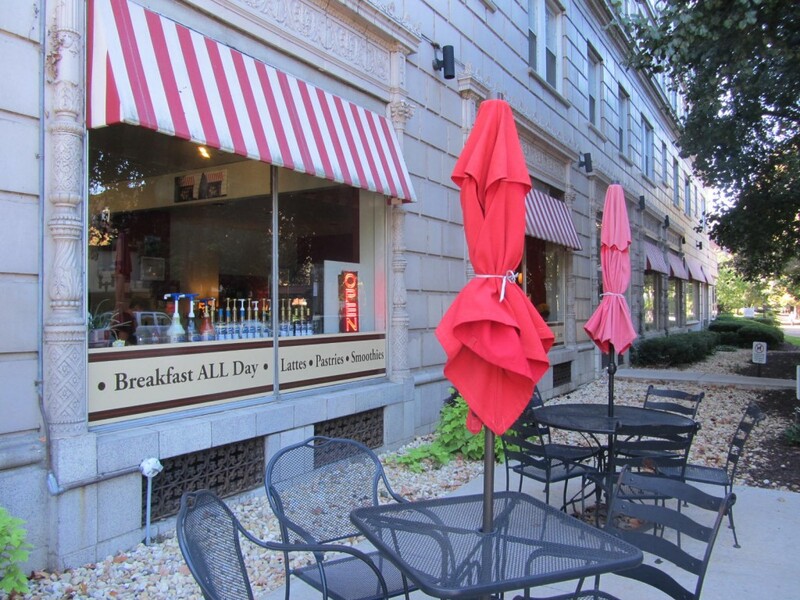 The Webster Groves location on Lockwood is a great place to hang out. It is fairly small and gets mobbed for lunch and weekend brunch, but I’ve never been there when I couldn’t get a table. They have a full breakfast and lunch menu available all day…the menu is so big I always struggle with what to pick. 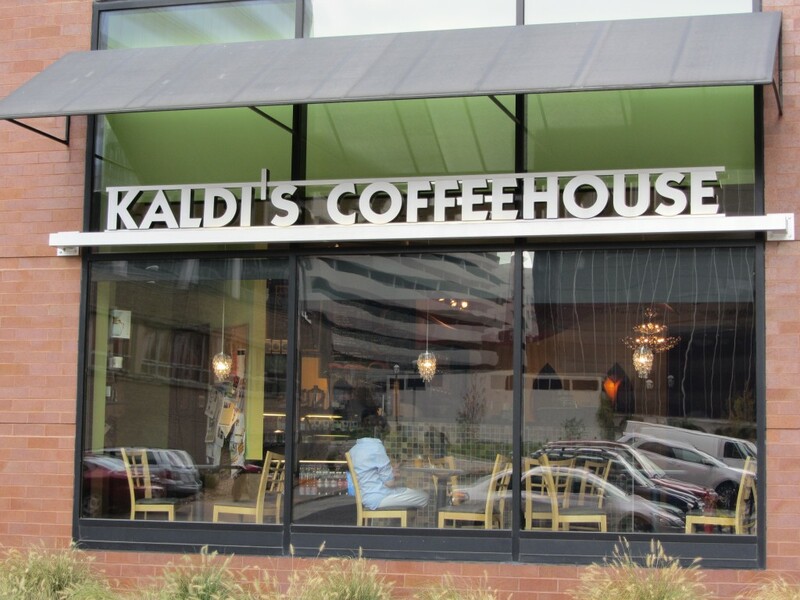 They serve Kaldi’s coffee with unlimited self-serve refills, so you know the coffee is good. Parking is also easy with a lot right behind the building. 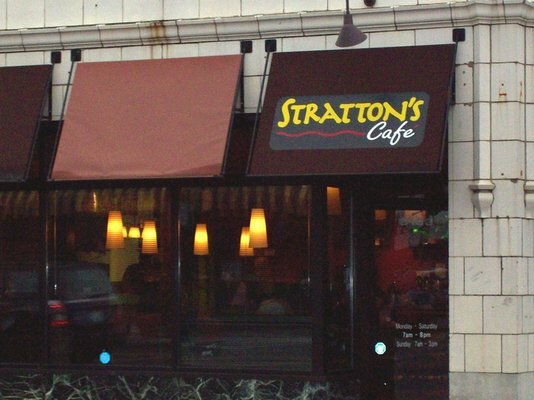 Once my real estate company opens the new Webster Groves location, I may have to pop over there to work occassionally just so I have an excuse to eat at Stratton’s. I really love this place. It has a warm neighborhood feel with good food, free refills and is big enough that I’ve never had a problem finding a table. Located at the intersection of Clayton & Kehrs Mill Roads, it is a welcome change in a mostly residential area that doesn’t offer many options for independent casual dining. They also have a large room that would be perfect for large groups. 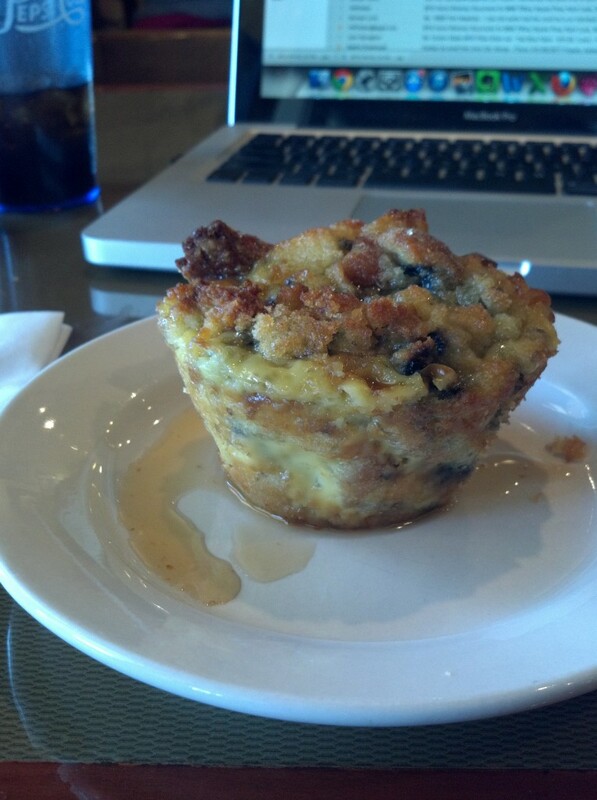 If you ever are there and they offer the blueberry bread pudding as a special, you are making a big mistake by not ordering it! 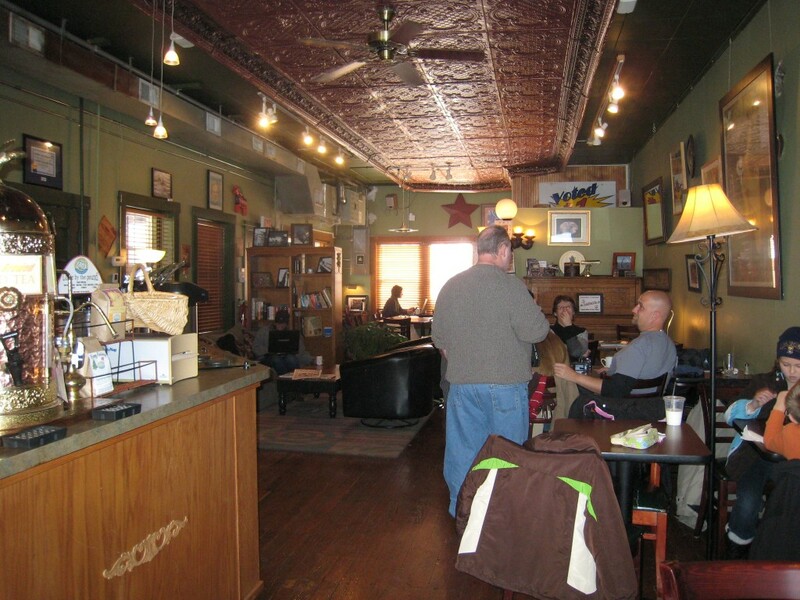 I really like the small town cozy feel in this coffee house and cafe. It feels like a neighborhood gathering place with a tables up front (cafe feel) and a few tables tucked away in the back (library reading room feel) separated by a couch and a couple of swivel leather chairs (your friend’s living room feel). Coffee is self-serve and they offer a bottomless cup. The menu is huge and covers breakfast and lunch. The service isn’t the best in town, and I’ve found the staff to be not so friendly at times, but I would still go there to get some work done if I was in St. Charles. 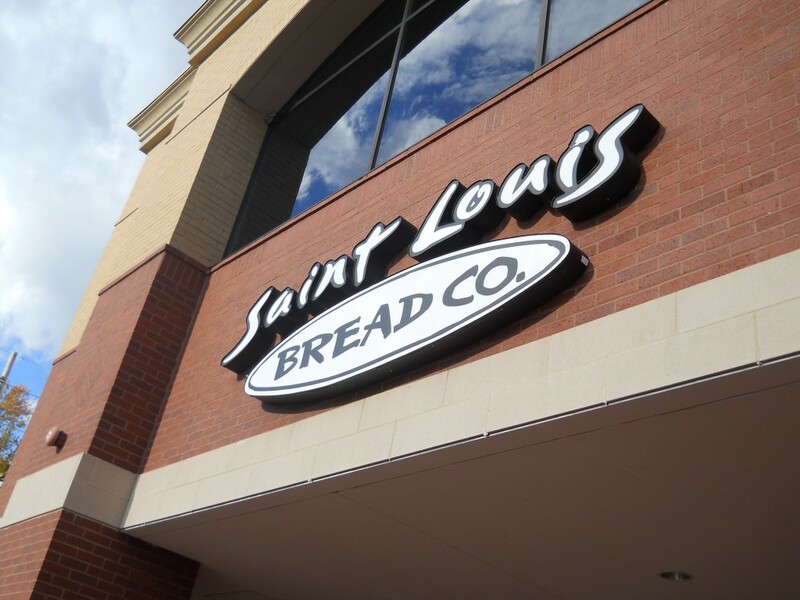 With locations all over town, Bread Co is the easiest choice for free WiFi. Every cafe has quite a few outlets plus enough seating that you can usually get a table near them. The only drawback – there is a 30 minute time limit on free WiFi from 11:30-2:00 pm. Given how busy they get at lunchtime, I can understand why they made this choice. Still, it has encouraged me to branch out and discover options where I can work for as long as I want. My favorite locations are UCity Loop, Creve Coeur and Brentwood. 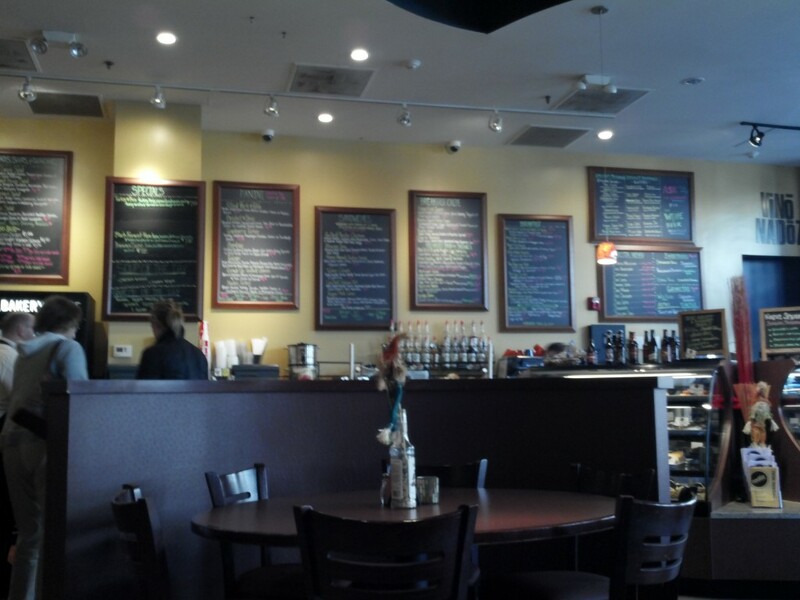 The food is great…and I love that they add seasonal soups and have added pasta to the menu. Some of these places I’ve been to once, but I’ve never brought a computer and hung out for a while. I need to change that…they all seem like they will offer an atmosphere I would love in neighborhoods that are some of my favorites. Am I missing anyplace else from my list that you think is the perfect work spot? I specialize in selling homes regardless of whether they will be the hot listing to hit the market or if they have a challenge that makes it much harder to sell.